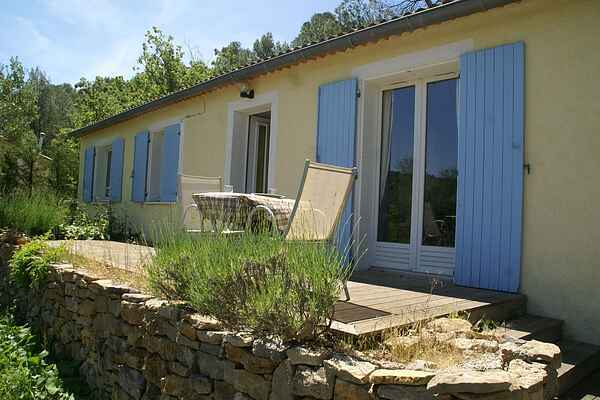 Grazing horses and amazing surrounding nature adorn the vicinity of this lovely detached holiday home in Lorgues (2 km). You can buy delicious fresh baguettes and mouthwatering croissants at the bakery in this village. And savour them later on your terrace all the while enjoying the privacy and tranquillity of your holiday home and private pool. There is a lot to do in Lorgues its surroundings. There is a nice farmer's market on Tuesdays. If you develop an appetite in the meantime, then you can always enjoy a delightful lunch or a drink at one of the many outdoor cafes hidden under the sycamore trees. If you do not wish to limit yourself to Lorgues, then you can also go the the villages of Flayosc (13 km), Villecroze (14 km) and Tourtour (16 km). An athletic day is also possible. It is very enjoyable to take canoe trips on the Argens river. For this you can board one at Entrecasteaux (13 km). If you would rather hit a ball, there are various golf courts in the vicinity of: Domaine Saint-Endréol bij La Motte (25 km) and Golf Barbaroux bij Brignoles (25 km). The beaches, such as the one at Fréjus (40km) are easily reached. Are you hungry? Dining in style is possible at the truffle king of France - the restaurant Chez Bruno in Lorgues.